Is the karate uniform you are currently using a bit worn out? Do you think you need a new outfit? Do you have enough money for a more ‘upmarket’ and heavier canvas attire? Then you would like to read this article on shopping for a heavy weight karate uniform. Heavyweight karate uniform or karategi weigh 14 ounces and higher. These are called ultimate karate uniforms, dedicated for the serious karateka. Obviously these are more expensive than the two other types of uniform, lightweight and middleweight. Of course, you should realize that a heavier uniform won’t make you perform better in class. But that said, it is still a good idea to invest in this type of uniform. For one, this should last a long time. It can also absorb a lot of sweat. When it comes to aesthetics, there’s no denying that heavy weight karategis look very good. You would be proud to be seen wearing one, and it can add to your confidence which is important as you try to progress in the martial arts. It’s not surprising that most karate practitioners prefer a heavy weight GI for more formal events like assessment and competition, while the lighter GIs are used for training and sparring. You should also realize some of the downsides of wearing a heavier uniform. One is that it would take a longer time to dry the attire. Plus, ironing it can be quite a task except if you buy one that is advertised to be ‘no ironing’ required. Karate uniform made of polyester/cotton blend can also dry fast. Another reason why many karate practitioners love using a heavy weight karate uniform is because it produces a snap, or an audible sound after a combination of high speed techniques followed by a sudden, crisp stop. Usually, a thick and stiff material of the uniform amplifies the audible snap sound which is why heavy weight karategis are desirable among many karate practitioners. In fact some karate practitioners even use starch to increase stiffness of the material and make the snap sound more audible. While it appeals to some vain karatekas, many karate instructors discourage snapping because it does not indicate that the technique was correctly performed. So don’t just buy a heavy weight karategi because it can make a snapping sound. So how much should you allot for a heavy weight karate uniform? Heavy weigh karate uniforms vary in prices, although the prices usually start at around $60. The price can go as much as $300 depending on the color, quality, and cut. If you are looking for a good brand of karategi, you can consider the Ronin Brand Shiai which makes canvas karategi from Japan. Shureido and Tokaido are also two other good brands of karate uniform. 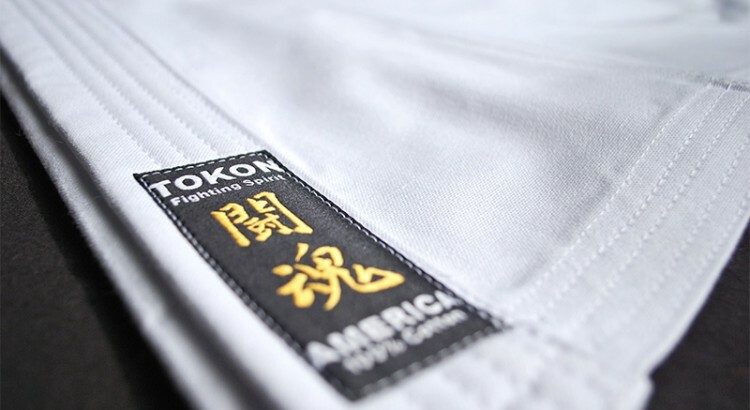 When you’re shopping for a heavy weight karategi, chances are you’ll buy a white one because white is the traditional color. But there are also uniforms in various colors like black, blue, and red. Still, you need to clear with your instructor on the color that is acceptable to wear. There are two styles of expensive, heavyweight karategis—tournament cut and traditional cut. The major difference between the cuts is the length of the jacket and pants. Traditional cut uniforms usually have full length pants and sleeves, while tournament cut uniforms are shorter thus exposing the lower leg and the forearm. Most manufacturers have their own sizing charts that you can refer to. You need to find your height range in the sizing chart so you can determine the right size for your body type. After finding your height range, then look at the corresponding weight range. In case your weight is not within that range, go down the weight column until your weight fits the right range. Should your weight put you in a larger uniform than your height, then your pants will end up too long. It will have to be hemmed up. But if your body weight puts you in a smaller size than your height, then you should opt for the uniform that corresponds to your height. The attire may fit a little loose. It is not uncommon for uniforms to get some tailoring work. So don’t fret if you can’t get the right size as there’s always a tailor who can help you out. Wearing a heavy weight karate uniform may give you a psychological boost, as you feel that you are closing in to your goal of a karate black belt. But you should also realize that an expensive uniform does not make you an expert right away. You would still have to go through the traditional route, which is to work hard in class and follow the instructions of your master in order to get your goal of a black belt.